Is garden equipment maintenance on your fall garden tasks list? 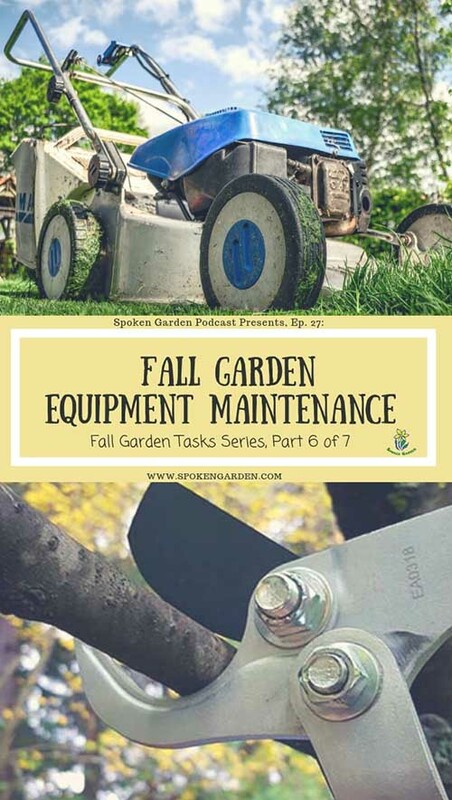 As part of our Fall Garden Tasks Podcast Series, this episode is full of fall garden equipment maintenance tips and tricks for your garden! Also included in this episode is a description of the benefits of fall leaves. Learn how leaves can build new soil layers in your garden soil. This episode is for those of you newbies to more advanced gardeners who need help with these maintenance tasks. Stay tuned for our last episode of the Fall Garden Tasks Series, Ep. 28: Fall Series Wrap-Up, Reflection, and Next Steps! Ep. 27 is part 6 of our 7-part podcast series for our Fall Garden Tasks and part of our Fall Garden Boot Camp Challenge! For more information on various fall garden tasks, check out our 7-episode Fall Garden Tasks podcast series!! Need Pruning Supplies For Your Fall Pruning Tasks?? Check out our Best Pruning Shears post here to learn what makes a good pruning shear and what we recommend! Check out our Best Loppers post here to read our recommendations!! Click on the graphic above to save "Fall Garden Equipment Maintenance" to Pinterest for later! Learn strategies for cleaning up, sharpening, and updating your garden equipment and hand tools. Part 6 of our 7-part podcast series of the 8 Fall Garden Tasks you should complete and part of our Fall Garden Boot Camp Challenge! Choose to Accept Our Fall Bootcamp Challenge to get your garden ready for this fall and winter! Starter Tool Sets For New Gardeners. Tips for cleaning 3 different garden tools. Ways to update your lawn mower. How to best maintain loppers or hand pruners. How leaves can build new soil layers in your garden soil and other benefits of fall leaves. Which tools are best for a beginning gardener. Top 7 Reasons Mulching Your Garden is Beneficial!